a tree without a root...."
You are welcome to copy information found at this site for personal use and share information with other researchers or genealogical organizations if you wish, but remember each bit of information found here or elsewhere must be researched and proved or disproved by weight of evidence by you, the researcher, and nothing here may be sold. Job was born April 16, 1741 in Rhode Island. He died January 27, 1835 in Caanan, Athens County, Ohio. He married Mary King. Known children are Daniel , Job and Spencer. Job was a Revolutionary War Veteren who served as Corporal in the 4th Connecticutt Regiment. SPENCER PHILLIPS was born 1790 in Pennsylvania, and died in Meigs County, Ohio. He married SUSAN "Betsy" STILES. She was born 1790 in Pennsylvania, and died Bef. 1850 in Meigs County, Ohio. Children of SPENCER PHILLIPS and SUSAN STILES are: Job born 1807, Daniel born 1811, John born 1816 and James Ashael born 1818-died 1850 in Ohio..
JAMES Ashael PHILLIPS married NANCY M. BEAVER, daughter of DAVID BEAVER and ANNA. She was born 1813 in Ohio. On Samuel's Civil War Hospital record, it shows his mother, Nancy M. Farmer or Parmer living in Burlingham Meigs County Ohio. On Samuel's death certificate, it states unknown Phillips as father and Nancy Beaver as mother.
. i. SAMUEL PHILLIPS, b. April 12, 1845, Athens Co. Ohio; d. October 28, 1931, Okeene, Oklahoma. 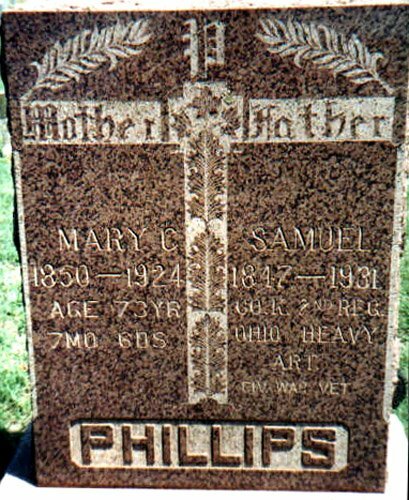 SAMUEL PHILLIPS was born April 12, 1845 in Athens Co. Ohio, and died October 28, 1931 in Okeene, Oklahoma. He married MARY CATHERINE JARVIS January 22, 1867 in Hocking County, Ohio, daughter of JOEL JARVIS and ELIZA PARKINSON. She was born December 24, 1850 in Perry County, Ohio, and died July 30, 1924 in Okeene, Oklahoma. Samuel Phillips was born in Athens, Ohio, April 12, 1847, and departed this life October 29, 1931, at the age of 84 years, 6 months, and 17 days. Okeene Record, Okeene, Blaine Co, Oklahoma, Thursday, October 28, 1931, page 5, col 1, Locals: Grandpa Phillips is under the doctor's care at the present time. Four pioneer residents of the Okeene community were claimed by death within three days last week. Two died on the 29th of October, one on the 30th, and one on the 31st. Two had reached the sunset age of life, while the other two were only on the advanced side of middle age. Samuel Phillips was born in Athens Co, Ohio, April 12, 1849, and departed this life October 29th, 1931, at the age of 84 years, 6 months, and 17 days. 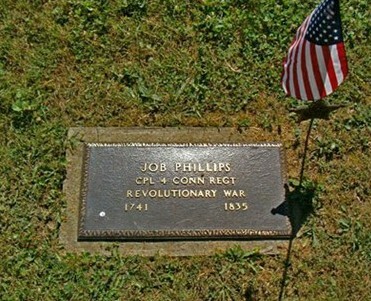 Mr Phillips was a Civil War veteran, serving 2 years and 9 months in Co K, 2nd Ohio. After the war he returned to Ohio and was married to Mary Kathleen Jarvis on Jan 22, 1866. From Ohio he moved to Iowa, living there until 1892 when he came to Oklahoma and settled on a farm five miles east of Okeene. He lived there until 1913, when he moved to Okeene. His wife preceded him in death, passing away July 30, 1924. Mr Phillips is survived by seven children. They are James Phillips, Greenville, Mo; Mrs Anna Filbert, Hennessey, Okla; Mrs Rosa Rogers, Woodward, Okla; Oscar L Phillips, Longdale, Okla; Mrs Lois Merker, Okeene, Okla; Alex Phillips, Okla City, Okla. Also 23 grandchildren and many other relatives and friends. Mr Phillips was a member of the M E Church. He helped build the Craig church, five miles east of Okeene, which later was consolidated with the Okeene M E church. Funeral services were held Saturday morning at the M E Church, conducted by the pastor, Rev J L Glass. Burial was in *Roselawn Cemetery. Honorary pall bearers were W W Haworth of Okeene, J P D Mouriquand of Homestead, and Rev J Bailey of Supply, Civil War veterans, the latter being a comrade in arms. Pallbearers were veterans of the World War. R F Howley was the undertaker in charge. Card of Thanks signed by J A Phillips, Mrs Anna Filbert, Mrs Rosa Rogers, Oscar Phillips, Charles Phillips, Mrs Lois Merker, and S A Phillips. Mr. Phillips was a Civil War veteran, serving 2 years and 9 months in Co. K 2nd Ohio. After the war he returned to Ohio and was married to Mary Kathleen Jarvis on January 22, 1866. From Ohio he moved to Iowa, living there until 1892, when he came to Oklahoma and settled on a farm five miles east of Okeene. He lived there until 1913, when he moved to Okeene. His wife preceded him in death by seven years, passing away July 30, 1924. *He is buried in Collins Cemetery and not Roselawn. Could there have been a name change? Samuel enlisted 2nd Reg. Co. K Hvy Arty at Camp Dennison, Ohio on Sept. 7, 1863 and mustered out Aug. 23, 1865. He was 16 when he enlisted. and Tom 1919 - 1959. Is this Andrews family connected to my Phillips line? I believe that Rufus R. Phillips (b. abt. 1878) may have been Samuel's nephew. Rufus R. Phillips had a horse-powered sawmill, and he helped to build the first Custer County Courthouse. He was later deputy or assistant county attorney. Enlisted in Company K, 2nd Heavy Artillery Regiment Ohio on 07 September 1863. Samuel's Civil War record shows his mother's name as Nancy M. Farmer / Parmer livinging Burlingham, Ohio (Meigs County) in 1865. Okeene Record, Okeene, Blaine Co, Oklahoma, Friday, August 1, 1924, p 5, Local Items: Mrs Samuel Phillips is quite ill, it is reported. Mary Catherine Jarvis, daughter of Joel A and Eliza B Jarvis, was b Dec 24, 1850 in Perry Co, Ohio. 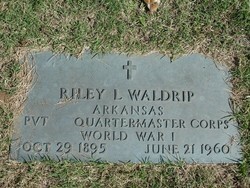 She died July 30, 1924, at Okeene, Oklahoma. She was united in marriage to Mr Samuel Phillips on January 22, 1867. To this union was born 9 children, five sons and four daughters, one son and one daughter having passed on before, and several still living, all of whom were present in these sad hours with the grief stricken father. Mrs Phillips had been an active christian worker since her girlhood days, and when Grandma Phillips, as she is commonly called, was spoken of, it would send thrills of Christian enjoyment through the heart as her only aim was to serve the Master and scatter deeds of kindness, which is so comforting to the loved ones left behind. She was laid to rest in the Collins cemetery beside her son. Card of Thanks signed by Samuel Phillips, James Phillips, Anna Filbert, Rosa Robinson, Oscar Phillips, Charles Phillips, Alex Phillips and Lois Merker. Marriage Record State of Ohio, Hocking County, ss. I certifiy that I solemnized the marriage of Samuel Philips and Mary C. Jarvis on the 22 day of January 1867; WM Davey J.P. Somehow Perry Latimer is connected with this family. i. MARION PHILLIPS, b. 1868, Ohio; d. March 21, 1896, Okeene, OK.
. ii. JAMES A. PHILLIPS, b. September 28, 1873, Indiana; d. March 1967, Warsaw, Benton, Missouri. iii. ANNIE PHILLIPS, b. 1874, Iowa; d. Aft. 1931; m. BAILEY. Lived in Hennessey, OK in 1931. Married a Mr. Filbert.
. iv. RHODA PHILLIPS, b. August 11, 1877, Ringgold Co., Iowa; d. March 12, 1919, Stafford, Kansas.
. v. ROSA PHILLIPS, b. August 11, 1877, Diagonal, Iowa; d. August 1940, Woodward, Oklahoma.
. vi. 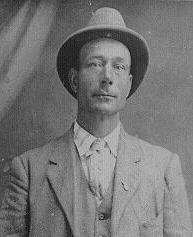 OSCAR L. PHILLIPS, b. April 13, 1883, Iowa; d. January 1967, Longdale, Blaine County, Oklahoma.
. vii. CHARLES H. PHILLIPS, b. December 21, 1885, Iowa; d. March 1976, Keyes, Cimarron County, Oklahoma.
. viii. LOIS J. PHILLIPS, b. August 1889, Iowa; d. Aft. 1931.
. ix. SAMUEL ALEXANDER PHILLIPS, b. November 16, 1891, Iowa; d. March 1972, Oklahoma City, Oklahoma. This picture was taken in Oklahoma.
. JAMES A. PHILLIPS was born September 28, 1873 in Indiana, and died March 1967 in Warsaw, Benton, Missouri. He married (1) HANNIE MARY (MINNIE) FERBER December 12, 1888 in Ringgold County, Iowa, daughter of CHARLES FERBER and CATHERINE SUHRE. She was born July 28, 1869 in St. James, Nebraska, and died October 19, 1955 in Wichita Falls, Texas. He married (2) ANNIE STEWART Bef. 1920. James and Minnie were living in Custer, Oklahoma in 1902 according to the obit of Minnie's father. Was told Minnie and James were divorced and James remarried. Minnie lived to be in her 86 yrs, 2 mo's, 22 days and died in Witchita Falls, Texas. She is buried there. James died around Oklahoma City, Oklahoma. i. WILLIAM HENRY PHILLIPS, b. August 13, 1889, Mt. Ayr, Ringgold County, Iowa; d. December 18, 1949, Bristow, Oklahoma. ii. CHARLES HERMAN PHILLIPS, b. March 09, 1891, Iowa; d. March 1972, Fort Worth, TX Tarrant Co..
iii. SADIE AMANDA CATHERINE PHILLIPS, b. November 13, 1892, Mt. Ayr, Ringgold County, Iowa; d. December 14, 1958, Riverside, California. iv. ELMER ELLSWORTH PHILLIPS, b. January 02, 1895, Ringgold Co. Iowa; d. May 17, 1918, Gate, Oklahoma. Elmer was killed by lightening. He was only 23.
v. LUCY LULA PHILLIPS, b. November 10, 1902, Beaver Co., Oklahoma; d. November 05, 1916, Englewood, Kansas Clark County. 13 years, 11 months, 25 days. vi. JACOB JOEL PHILLIPS, b. September 17, 1905, Deep Creek, Oklahoma. vii. AMANDA ROSA REBECCA PHILLIPS, b. October 23, 1907, Oklahoma. viii. BERTHA BIRDIE PHILLIPS, b. January 21, 1912, Valley Springs, Arkansas. Bertha (Aunt Byrdie), Jacob, Amanda, Sadie, Willie. Taken 1952 in California. RHODA PHILLIPS was born August 11, 1877 in Ringgold Co., Iowa, and died March 12, 1919 in Stafford, Kansas. She married (1) WILLIAM DELLINGER. She married (2) MART POND May 17, 1905 in St. John, Kansas. This community was shocked Wednesday morning of last week when the sad news of the death of Mrs. Mart Pound was reported. She had been ill only a short time, being brought from her home south of town to the sanitarium (Butler's) Thursday evening of the previous week. She had the flu and everything that loving hands could do was done, but to no avail as pneumonia, with a complication of the heart, quickly developed and she passed away at 6 o'clock that morning. Rhoda Phillips was born in Ringold county, Iowa, August 11, 1877 and died at Stafford, Kansas, March 12, 1919: age 41 years, 7 months and 1 day. She was married to William Dellinger, who a few years later passed away. She was married to Mart Pound, May 17, 1905, at St. John, Kansas and since that time has made her home south of the city (House is still there and is still occupied - didn't think to take a picture of it when I was there). 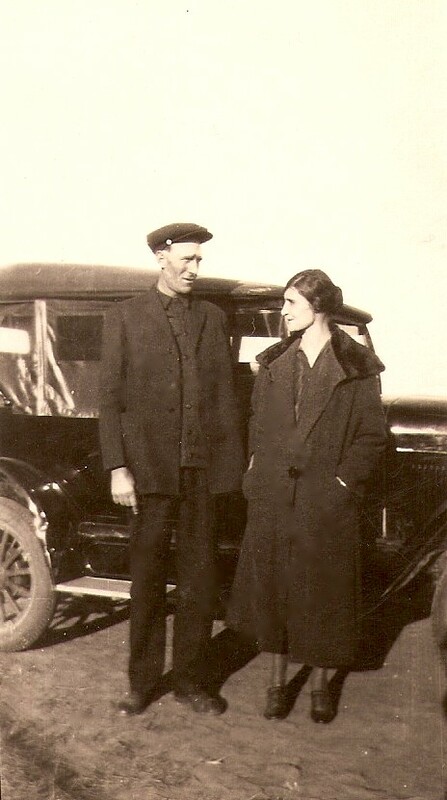 Besides her husband, she leaves her parents, Mr. and Mrs. Samuel Phillips of Okeene, Okla., three sisters and four brothers - James Phillips of Gate, Okla., Mrs. Anna Bailey of Hennessey, Okla., Mrs. Rosa Haworth of Tulsa, Okla., Oscar Phillips of Okeene, Okla., Charles Phillips of Oklahoma City, Okla., Elic Phillips of Oklahoma City, Okla., and Mrs. Lois Gregg of Forth Worth, Texas - other relatives and many friends mourn her death. Funeral services were held Sunday afternoon at 2:30 o'clock at the M.E. church and were conducted by Rev. Guy Spear. Music was furnished by Geo. Dale,, Miss Bernice Pafford, Miss Hazel Akers and J.L. Ament. Interment was made in the Stafford cemetery. The Courier joins the friends in extending sincere sympathy to the bereaved relatives in their hour of sorrow. i. CORA ROSA LEE10 POND, d. March 31, 1910, Stafford, Kansas. ROSA PHILLIPS was born August 11, 1877 in Diagonal, Iowa, and died August 1940 in Woodward, Oklahoma. She married LEWIS N. HAWORTH 1896. He was born November 30, 1868 in Henry County, Iowa, and died June 21, 1950 in Caddo County, Oklahoma. The Okeene Record, August 1940. Rosa PHILLIPS was born August 11, 1877, at Diaginal, Iowa. She came to Oklahoma at the opening of the Cheyenne and Arapaho county and grey (grew) to womanhood with her parents, Mr. and Mrs. S. A. PHILLIPS, on a claim fives miles east of Okeene. She was united in marriage to Lewis HAWORTH and to this union were born three children. One son, Clarence, preceded her in death in June, 1927. Mrs. HAWORTH is survived by a daughter and a son, Mrs. Stella GOSSETT of Gracemont, and Nathan L. HAWORTH of Ada; four brothers and one sister, Oscar and Chas. PHILLIPS of Okeene, Sam PHILLIPS of Oklahoma City, Jim PHILLIPS of Missouri, and Mrs. Ed MERKER of Donaphin, Mo. Mrs. HAWORTH died at Woodward and the body was brought to Okeene for burial beside her son in the Collins cemetery. Services were conducted at the Howley Funeral Home Chapel by Rev. G. C. HUTCHINS, pastor of the Methodist Church. STELLA E. HAWORTH, b. 1897, Oklahoma; m. ? GOSSETT. NATHAN L. HAWORTH, b. June 15, 1898, Okeene, Oklahoma; d. December 27, 1984, Roseville, California; m. MARY OPAL RAMSEY, March 28, 1933. CLARENCE N. HAWORTH, b. October 20, 1907, Oklahoma; d. June 09, 1927, St. Louis, Missouri. OSCAR L9 PHILLIPS was born April 13, 1883 in Iowa, and died January 1967 in Longdale, Blaine County, Oklahoma. He married ELIZA M. HENZLER. She was born 1884 in Indiana, and died Bef. 1930. SAMUEL O PHILLIPS, b. 1908. LEWIS N PHILLIPS, b. 1910, Ordway, Oklahoma. LUCILLE PHILLIPS, b. 1910, Oklahoma. ROSANNA PHILLIPS, b. 1910, Longdale, Oklahoma. HARRY PHILLIPS, b. 1913, Oklahoma. FRANK PHILLIPS, b. 1915, Oklahoma. RHODA PHILLIPS, b. 1917, Oklahoma. TOM ORVILLE PHILLIPS, b. 1919, Oklahoma. CHARLES H. PHILLIPS was born December 21, 1885 in Iowa, and died March 1976 in Keyes, Cimarron County, Oklahoma. He married CAROLINE E. CARTER. She was born 1895 in Missouri, and died Bef. 1930. Child of CHARLES PHILLIPS and CAROLINE CARTER is: CALVIN S.10 PHILLIPS, b. 1917. LOIS J. PHILLIPS was born August 1889 in Iowa, and died Aft. 1931. She married GEORGE? GREGG. He was born in Iowa. Lived in Okeene, OK in 1931. Married a Mr. Merker then Mr. Gregg. Found living with parents as Lois J. Gregg in 1920 Blaine Co., OK census. Children of LOIS PHILLIPS and GEORGE? GREGG are: GEORGE GREGG, b. 1907, Oklahoma. EDWIN GREGG, b. 1911, Kansas. SAMUEL ALEXANDER PHILLIPS was born November 16, 1891 in Iowa, and died March 1972 in Oklahoma City, Oklahoma. He married STELLA GARRIN. She was born 1895 in Indiana. Lived in Oklahoma City, OK 1930 according to census. Brother in law Perry Garrin lived with the family. Sam A. was a Police Officer for Oklahoma City in 1930. Children of SAMUEL PHILLIPS and STELLA GARRIN are: BETTY JO PHILLIPS, b. 1928, Oklahoma. i. DOROTHY PHILLIPS, b. 1929, Oklahoma. WILLIAM HENRY PHILLIPS was born August 13, 1889 in Mt. Ayr, Ringgold County, Iowa, and died December 18, 1949 in Bristow, Oklahoma. He married MARY FLOYD GALLAGHER March 16, 1905 in Valley Springs, Arkansas, daughter of WILLIAM GALLAGHER and MARY WALLIS. She was born July 02, 1889 in Valley Springs, Arkansas, and died February 1986 in Bristow, Oklahoma. 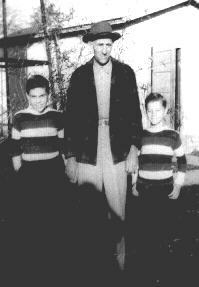 William Henry Phillips with his grandson's, Bruce and Charles Phillips. "Willie" passed on Dec. 18, 1949 at Bristow, Okla. 60 yrs. 4 mos. 5 days He worked in oil fields. Image source: Year: 1930; Census Place: Bristow, Creek, Oklahoma; Roll: 1900; Page: 12B; Enumeration District: 3; Image: 102.0. All three children that Mary and William had were born in Valley Springs, Arkansas, where Mary's Mother lived. No matter where they were living, Mary always went home to her Mother to have her babies. Granny was a hard working woman. She canned peaches, blackberries, did wash ing (using a washboard) and ironing for people. When they had chickens, she sold eggs. Children of WILLIAM PHILLIPS and MARY GALLAGHER are: OLA PHILLIPS, b. June 15, 1906, Valley Springs, Arkansas; d. February 25, 1991, Tulsa, Oklahoma; m. RILEY WALDRIP; b. October 29, 1895; d. June 1960. Parent's were living in Kansas when Ola was born. Ola and Riley had no children. ii. NORMAN ALLEN PHILLIPS, b. June 12, 1912, Valley Springs, Arkansas; d. October 25, 2001, St. Louis, Missouri. iii. CLARENCE HENRY PHILLIPS, b. October 22, 1913, Valley Springs, Arkansas; d. January 09, 2002, Casper, Wyoming. CHARLES HERMAN PHILLIPS was born March 09, 1891 in Iowa, and died March 1972 in Fort Worth, TX Tarrant Co.. He married IRENE. She was born 1902 in Texas. Found living in Wichita Falls, TX 1920 census with wife, children and Mother, Minnie, brother, Jacob and sisters, Amanda and Bertha. i. CHARLES11 PHILLIPS, b. 1918.
ii. ELMER PHILLIPS, b. 1919. 13. 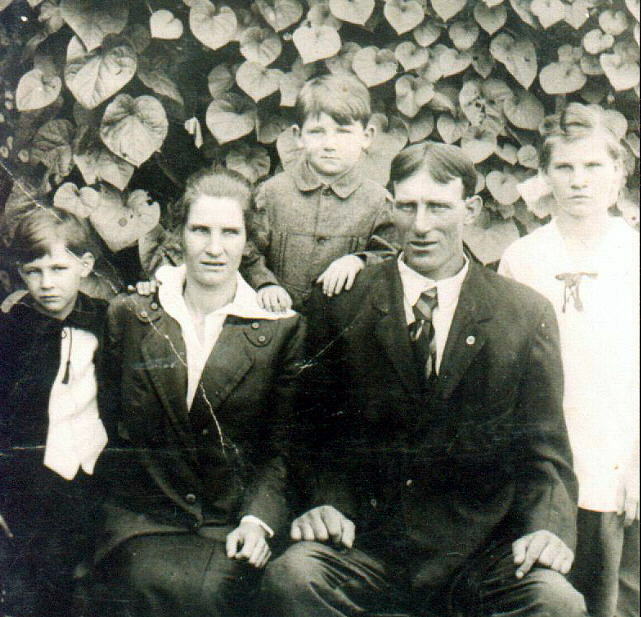 SADIE AMANDA CATHERINE PHILLIPS was born November 13, 1892 in Mt. Ayr, Ringgold County, Iowa, and died December 14, 1958 in Riverside, California. She married WILLIAM LEE ANDREW KELLEY November 18, 1908 in Surprise, Beaver City, Oklahoma. He was born July 24, 1879 in Hardin County, Alabama. i. MARVIN EDWARD11 KELLEY, b. December 09, 1909, Ogletree, Texas. ii. TOT KELLEY, b. July 12, 1911, Ogletree, Texas. 17. iii. HAZEL MAE KELLEY, b. August 15, 1912, Englewood, Kansas. iv. DARLING BABY KELLEY, b. May 12, 1914, Collonsville, Oklahoma. v. GOLDIE JEWELL KELLEY, b. July 07, 1915, Englewood, Kansas. vi. KING DAVID KELLEY, b. September 11, 1916, Englewood, Kansas. vii. PERNIE PEARL KELLEY, b. November 05, 1918, Blackwell, Oklahoma. viii. CLARANCE CALVIN KELLEY, b. September 28, 1921, Englewood, Kansas. ix. ROSE LEE KELLEY, b. February 20, 1923, Englewood, Kansas. 18. x. MARY ALICE KELLEY, b. April 03, 1924, Wichita, Kansas/Wichita Co., KS. 14. LEWIS N PHILLIPS was born 1910 in Ordway, Oklahoma. He married EUNA STALLINGS 1929 in Oklahoma. i. BETTY PHILLIPS, b. 1930. 15. NORMAN ALLEN PHILLIPS was born June 12, 1912 in Valley Springs, Arkansas, and died October 25, 2001 in St. Louis, Missouri. He married MARY MAXINE SUMNER June 18, 1934 in Bristow, Oklahoma, daughter of WILLIAM SUMNER and FRANKIE WILSON. She was born May 16, 1916 in Cureall, Howell Co, MO. i. NORMA JEAN12 PHILLIPS, b. September 22, 1936, Bristow, Oklahoma; d. July 06, 1995, Bristow, Oklahoma; m. (1) ROBERT ARTHUR CLARK; m. (2) JAMES EDWARD CHARLES BROWN. ii. MARYLIN YVONNE PHILLIPS, b. September 12, 1940, Patterson, Wayne County, Missouri; d. September 21, 1993, Cedar Hill, Missouri; m. JACK DELANO MORLEY. iii. WILLIAM RAY PHILLIPS, b. November 18, 1944, St. Louis, Missouri; d. August 02, 2008, Paducah, Kentucky; m. MARY ANNE DE CLUE. William 'Santa' Ray Phillips Sr.
William "Santa" Ray Phillips Sr., 63, of Paducah died at 9 p.m. Saturday, Aug. 2, 2008, at his home. A native of St. Louis, Mo., Mr. Phillips served in the U.S. Army during the Vietnam War and was a retired car salesman. He attended Southland Baptist Temple. 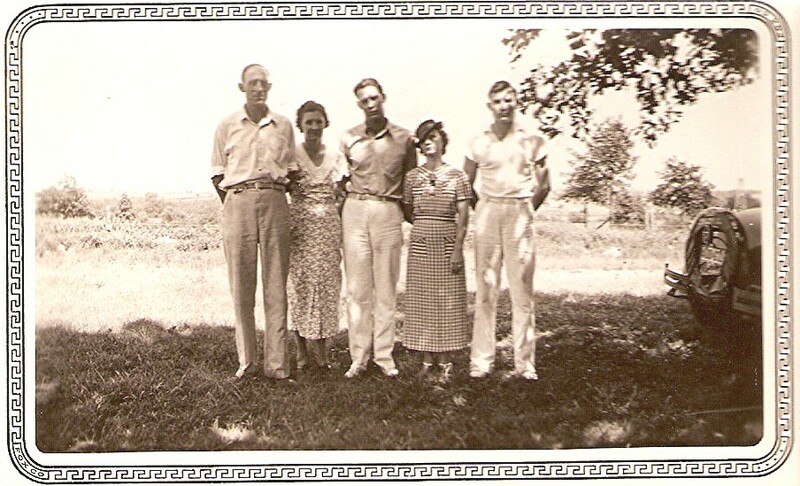 Surviving are two sons, William Phillips Jr. and his wife, Billie, of Paducah, and Joseph Allen Phillips of Paducah; one stepson, Daniel Hicks of Louisville; one sister, Barbara Gossard of St. Louis; one daughter-in-law, Pam Phillips of Paducah; his grandchildren, Dawn Phillips, Kayla Phillips, Brandon Phillips, Jeremy Phillips, Leslie Phillips, Brandy Cooper and Chris Cooper; four great-grandchildren; and several nieces and nephews. Mr. Phillips was preceded in death by his wife and soulmate, Carol Phillips; his first wife, Mary Ann Phillips; his parents, Norman and Maxine Phillips; one great-grandson; and two sisters. Memorial services will be conducted at a later date. Milner & Orr Funeral Home of Paducah is in charge of arrangements. iv. BARBARA ELAINE PHILLIPS, b. July 28, 1946, St. Louis, Missouri; m. (1) CLARENCE EDWARD GRIMES; m. (2) GOSSARD. CLARENCE HENRY "RED" PHILLIPS was born October 22, 1913 in Valley Springs, Arkansas, and died January 09, 2002 in Casper, Wyoming. 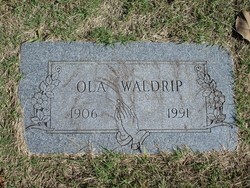 He married MILDRED ANN BAKER July 24, 1934 in Ada, Oklahoma, daughter of ERWIN BAKER and LEONA BYNUM. 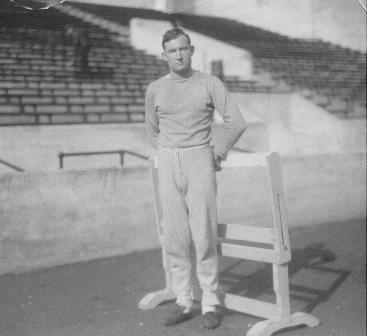 Clarence Henry or "Red" as he is known, went to Bristow High School. He was on the track team and played football there. The Bristow High School football team went to State in the 1920's. They beat Sapula 7 to 6. Red made the touchdown and the extra kick that won the game. He received letters from Notre Dame and Penn State offering him scholarships. He declined and went to Tulsa University where he was a football and track star. Red, "alone" qualified to go to Oklahoma City for state track to represent Bristow. He won the 100, 220, 440 and placed high in the high and low hurdles and pole vault. Red then went to the Drake Relays and to the National's in Chicago, where he met Jesse Owens. In the first race Red beat Jesse Owens. In the next, he hit a hurdle and fell down, but still got 3rd place. Jesse Owens borrowed Red's shoes for the race in which he won. My Grandpa, Red, kept those shoes and gave one to each of his son's. He was asked to go to the Olympics and enter the decathelon in 10 events, but he didn't. Instead, he married my Grandma and stayed in Oklahoma until he went to work for Gulf Oil where he was employed for over 40 years. When "Red" was younger, he delivered his Mother's washings in his little wagon. There wasn't anything he wouldn't do for her. He worshipped his Mother. If she was canning two bushels of peaches, he would be helping her, if it took all day. That meant washing jars, peeling peaches, getting them ready to put in the pressure cooker, a few at a time, or bringing them to a boil, then canning them. He and his Father would go out and pick about two bushels of wild blackberries; then "Red" and his Mother canned them; it is very hot in Oklahoma and they had no electic fans or air conditioners. No matter what his Mother had to do, he was there. *Even though they lived in Oklahoma, Red's mother, Mary Gallagher Phillips, always went home to Arkansas when she had her three babies. 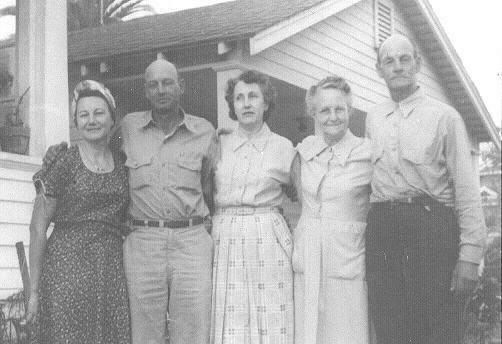 My Grandma, Mildred (Baker) Phillips, my Daddy, Bruce and my Uncle Charles taken in 1947.
i. Living PHILLIPS, m. NORMA ELAINE BUNDY, July 08, 1955, Centralia Township, Marion County, Illinois; b. July 08, 1936, Romaine Township, Dix, Illinois; d. March 07, 2003, Centralia, IL. Children of Living Phillips and living COOK are"
17. HAZEL MAE11 KELLEY (SADIE AMANDA CATHERINE10 PHILLIPS, JAMES A.9, SAMUEL8, JAMES7, SPENCER6, DANIEL5, ?4, ? ?3, ?? ?2, ??? ?1) was born August 15, 1912 in Englewood, Kansas. She married JOHN HARROD. i. JOE12 HARROD, m. DELORIS UNKNOWN. 18. MARY ALICE11 KELLEY (SADIE AMANDA CATHERINE10 PHILLIPS, JAMES A.9, SAMUEL8, JAMES7, SPENCER6, DANIEL5, ?4, ? ?3, ?? ?2, ??? ?1) was born April 03, 1924 in Wichita, Kansas/Wichita Co., KS. 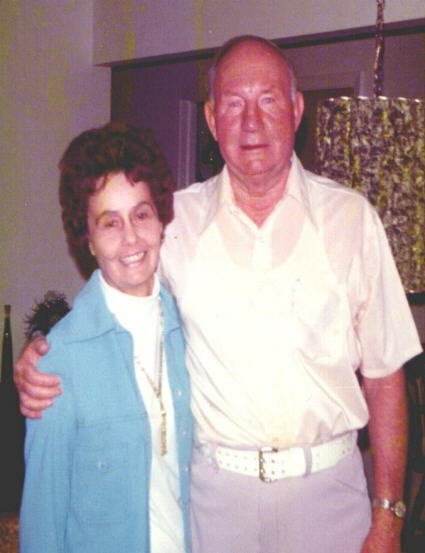 She married MENFORD E. HESTER May 11, 1945 in Almameda Co., California. i. Female HESTER, ; m. DAVEY, February 08, 1963.
ii. female HESTER, m. BINDERIM, May 29, 1964.